and we will help you create a solution to fit your unique label needs! As part of the commitment to our mission and our customers, I.D. Images’ Product Development Team strives to create solutions. By working within the entire supply chain, we utilize our expertise and broad network of suppliers to not only introduce new products but devise improvements that cater to our customers’ needs. We design solutions with our customer's end use requirements, cost effectiveness and the environment in mind. Wondering what ID Images can do? Every so often, a customer will run into a problem. Who doesn’t? 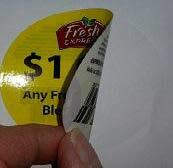 In spring of 2015, ID Images was challenged to come up with a solution that made distribution and handling of Instant Redeemable Coupon labels easier for their crew. In just 8 weeks, ID Images was able to create and produce a sample that converted small rolls to 8.5 x 11 sheets, allowing the instant redeemable coupons to be managed easier.